If your New Year’s resolution is to declutter in 2019, All Storage is ready to make your goal attainable by offering even more self storage options. It just so happens that our New Year’s resolution is to open six brand new storage facilities in the Dallas Fort Worth Metroplex—and we’re sticking to it. Whether you’re looking for a storage unit in Arlington, Frisco, Garland or somewhere else in the area, we’ll have you covered. These brand new All Storage facilities will feature a wide mix of units and modern amenities like our EZ Drive-Thru, which allows you to drive your vehicle into a fully enclosed building and park right in front of your storage unit. You can also expect climate control, month-to-month leases, security cameras, moving supplies sold on-site and our signature box office design (aka a giant, realistic looking cardboard box out front) that makes for a pretty good selfie background. This All Storage facility is set to open in early 2019, so if you live in Rowlett or the Garland area, you’re going to want to keep an eye out for this brand new facility. The Rowlett property will feature approximately 1,287 units and EZ Drive-Thru storage. Residents of Arlington will have their choice of approximately 1,489 storage units at this facility which is on track to open in early spring. Conveniently located near IH-20 westbound, this All Storage facility offers EZ Drive-Thru and will be easily identified by the box office design. Frisco is growing fast, which is why this upcoming All Storage facility is expected to be a popular one. Located near Toyota Stadium and residential and commercial space, this facility will have an estimated 1,404 units and will include the EZ Drive-Thru feature. You can plan on renting a storage unit at the Frisco All Storage facility in mid-spring. Just one mile from the Mansfield StarCenter athletic complex and the upcoming Shops at Broad development, you’ll find the site of the soon-to-be-open Frisco All Storage facility. Slated to open in mid-spring, this facility will offer approximately 1,326 storage units, EZ Drive-Thru storage and the creative box office design. This storage facility is another great option for Arlington residents. Situated near Kroger and a new commercial development, the Sublett/Joplin All Storage facility in Arlington, TX will offer on-site retail and an estimated 1,221 storage units. The facility is set to open in late spring. 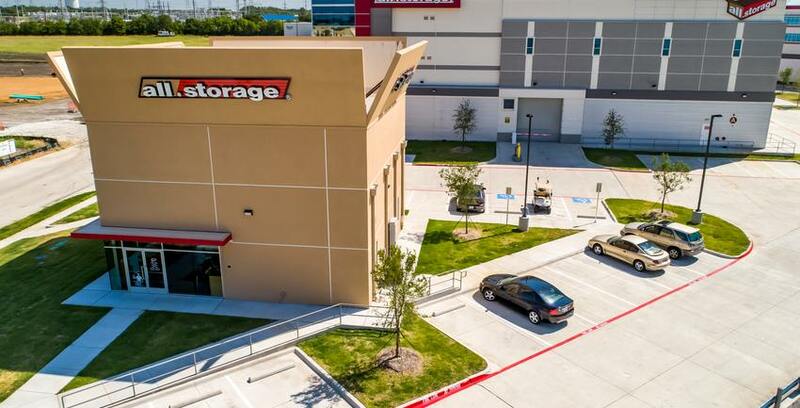 Looking for self storage in Garland? Plan on reserving a storage unit at the upcoming Bunker Hill facility, which will be located one mile away from popular shopping and dining space Firewheel Town Center. This All Storage facility, set to open this summer, will feature EZ Drive-Thru storage and approximately 951 storage units.